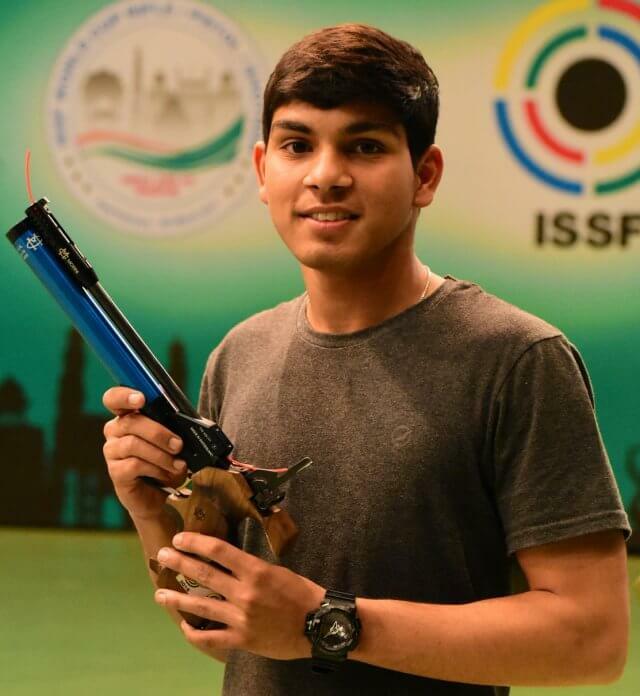 Promising youngster Anmol Jain was bang on target to claim the gold in the Men’s 10m Air Pistol at the 11th Sardar Sajjan Singh Sethi Masters Shooting Championship, underlining his growing prowess. The 18-year-old shooter from Haryana has been in great form since the last National Championship where he had upstaged several big names to be crowned the new national champion. Anmol who shot the highest qualification score of 582 (94,96,100,99,97,98) was very consistent in the finals and shot 243.7 which included three near perfect shots on 10.8 to claim the yellow metal, 3.7 points ahead of Army’s Yashwant Singh. The bronze was won by Maninder Singh of Punjab. Abhishek Arya of Haryana was impressive in the junior and youth finals as he won gold in both the categories while Punjab’s Arjun Singh and Surender Singh won the silver and bronze respectively in the juniors. The silver in the youth event was won by Surender Singh while Gaurav Rana of Air Force took the bronze. In the Women’s 10m Air Pistol, 16-year old Muskan, who recently represented India in the ISSF World Cup in New Delhi, won the gold. Muskan who qualified for the finals with not a very impressive qualification score of 368, led from start to finish in the finals to claim the Gold. Punjab’s Shweta Devi won the silver while Yashaswini Singh of Haryana won the bronze. Swapnil Kusale won the gold in the Men’s 50m Rifle Prone while Navy’s Rahul Poonia who had won the prone gold on Sunday, claimed the silver. Kapil Rana of the Army won the bronze. Men’s 10m Air Pistol: 1. Anmol Jain 243.7 (582); 2. Yashwant Singh 240.0 (578); 3. Maninder Singh 217.9 (579). Junior Men’s 10m Air Pistol: 1. Abhishek Arya 242.9 (575); 2. Arjun Singh 238.3 (578); 3. Surinder Singh 216.7 (573). Youth Men’s 10m Air Pistol: 1. Abhishek Arya 238.7 (575); 2. Surinder Singh 237.1 (573); 3. Gaurav Rana 216.1 (572). Women’s 10m Air Pistol: 1. Muskan 237.9 (368); 2. Sweta Devi 234.7 (380); 3. Yashaswani Singh 215.4 (375). Junior Women’s 10m Air Pistol: 1. Anushka Patil 240.0 (370); 2. Yashaswani Singh 236.3 (375); 3. Sweta Devi 218.5 (380). Youth Women’s 10m Air Pistol: 1. Harshada Nithave 235.8 (377); 2. Manu Bhaker 233.6 (369); 3. Krupa Patel 212.3 (377). Men’s 50m Rifle Three Position: 1. Swapnil Kusale 456.1 (1165); 2. Rahul Poonia 452.4 (1156); 3. Kapil Rana 439.6 (1151). Junior Men’s 50m Rifle Three Position: 1. Amit Kumayu 446.0 (1114); 2. Nishant Dalal 440.4(1143); 3. Harshit Binjwa 426.8 (1126).